The exterior walls of the Gibsons, B.C. home are insulated with 100-millimetre-thick wood-fibre panel insulation fastened to the outside of 3-ply 100-millimetre-thick CLT load-bearing walls. The B.C. 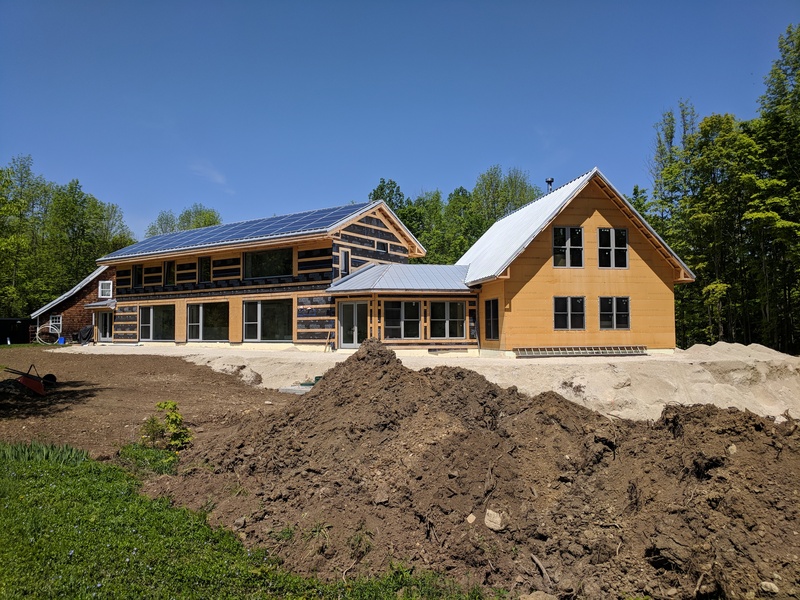 home, completed in the spring, is the last of the high-performance projects built to Passive House standards in the trial. 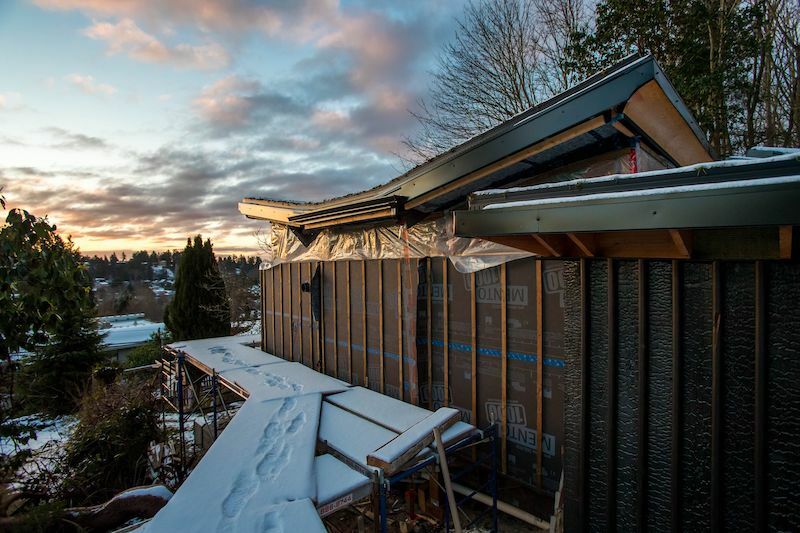 Contractors used wood-fibre insulation panels imported from Europe, where they’re a mainstay in home construction, instead of rigid foam, to insulate exterior walls. The trio behind the initiative are certain the panels can be manufactured in Canada far less expensively than in Europe, with an R-factor rating equivalent to rigid foam panels. FPInnovations designed tests to determine the fire safety, stability, durability, and insulation rating of the panels. Wood-fibre insulation demonstrates superior fire performance compared to polymer foam insulation types that are currently used in North America. The panels also show superior moisture management in wall and roof systems compared to polymer foam insulation. Additionally, the panels have greater thermal mass, reducing the temperature rise and fall in an interior space. 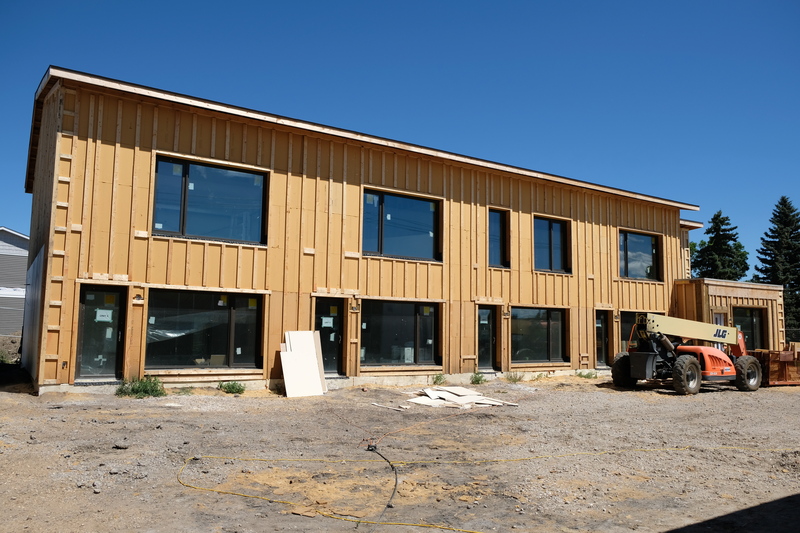 Wood-fibre insulation panels were attached to the exterior of two-by-six insulated load-bearing stud walls in the Radiance co-housing project in Saskatoon, Sask. The panels are made using a dry-processing method of refining wood chips and shavings. The resulting fibre is dried, mixed with polyurethane adhesive and paraffin, formed into a continuous fibre mat, sized to desired thickness, and cured. The resulting panels are then milled to different sizes and edge configurations. The manufacturing process allows for a homogeneous board from 20 to 300 millimetres thick. The panels offer R-values in the 3.5 to 3.9-per-inch-range, while polymer foams have R-values in the 4.5 to 6-per-inch-range. Therefore, wood-fibre panels need to be a little thicker to reach the same R-values as polymer foams. The three residential building projects were selected in part for their locations in different Canadian climate regions. The Ontario building is a single-family residence near Collingwood in cold-humid climate zone 6A. The Saskatoon, Sask. project is a nine-unit co-housing development in very cold climate zone 7, while the B.C. house located in Gibsons is in mixed-marine climate zone 4C. The Collingwood renovation project adds a two-storey contemporary addition to a 150-year-old pioneer cedar log house. Eighty-millimetre dry-process wood-fibre insulation panels are attached to the outside of two-by-eight load-bearing stud walls sheathed with half-inch plywood. The Saskatoon co-housing project showcases low cost of living through low energy use. It has both 40-millimetre and 240-millimetre panels attached to the outside of two-by-six insulated load-bearing stud walls sheathed with 3/4-inch plywood. The B.C. single-storey prefabricated house is built to meet LEED Platinum standards. Its exterior walls are insulated with 100-millimetre-thick wood-fibre panel insulation fastened to the outside of 3-ply 100-millimetre-thick CLT load-bearing walls. The green roof has 240-millimetre wood-fibre panel insulation. Performance monitoring instrumentation is installed onto the prefabricated wall and roof modules. The instrumentation installed in each building consists of point moisture measurement, relative humidity and temperature sensors, data logger units, and a tactical intelligence gateway. Each home’s performance is being monitored by FPInnovations for at least one year and meaningful results are expected by July of 2019. Wood-fibre insulation panels were used to insulate the exterior walls of the two-storey addition to a 150-year-old Collingwood, Ont. pioneer log home.